Hannah Brown never thought she’d have a best friend like Ellen Brecht. Ellen is everything she isn’t – beautiful, daring, glamorous and fierce. Growing up together in rural Cornwall, life seems perfect. But their idyllic childhood is shattered by obsession, betrayal and, ultimately, tragedy. Hannah has tried for twenty years to forget what happened during that terrible summer. Then, one ordinary morning at work, she glimpses a woman who is identical to Ellen. Can it really be her? And has Ellen returned to forgive her – or to punish her? I was gripped by this novel, it has all the essentials for a good read; compelling characters, beautiful settings, an intriguing story and a little bit of mystery to keep you guessing along the way. The story is told by Hannah who is in her thirties and working for a museum, she is thrown into turmoil one day by a glimpse of her old friend Ellen Brecht and we discover that Hannah’s past holds secrets and a history of mental illness because of childhood events that she has never really recovered from. Through Hannah’s life now and her reminiscences we gradually discover what she is hiding from and why Ellen’s possible return is so significant. Ellen and her family burst into Hannah’s quiet life bringing an excitement and vibrancy that Hannah is drawn to like a moth to the flame, but there are hidden dangers and her youthful eyes don’t see the whole picture or the darkness within this family. Ellen is strong, fierce and determined (all things Hannah is not) they form a strong friendship, along with with Hannah’s adopted brother Jago. They grow through their teenage years together with the angst that goes with that and the added problems caused by Ellen’s family and Jago’s history. Hannah has her own qualities and is a good friend to Ellen, but also struggles with jealousy and loneliness and feeling of betrayal as Ellen and Jago grow closer. She is a very complex character and the many facets come together along with the events so we can understand why she has suffered mental illness. As events roll on in the present we are left wondering if she is having more episodes and if she is heading for another breakdown. As secrets are revealed and the darker elements come to the fore all the characters show their best and worst sides. I really enjoyed the build-up and revelations when they came, some things I didn’t see coming at all. The whole story is very atmospheric and there is a chill that pervades the book as we wonder where this is all going and how Hannah is going to cope with re-living the horrors of her past. Verdict:I really enjoyed this and have already got another of Louise’s books on the Kindle to read soon! If you are a Young Adult author, whether you are traditionally published, Indie published or Self-Published, they are offering a number of ways to get your work promoted on TeamNerd Reviews! Just fill out the form below and they’ll make sure to add you to the schedule! They’re also hosting I HEART Young Adult Nominations where fans can nominate their favorite author, favorite bad boys, heroines, boy next door, kickbutt heroines and more! On her summer holiday by the sea, pony-mad 8½-year-old Pippa is transported to Chevalia. A beautiful white pony gallops over and introduces herself. This is Princess Stardust, the youngest pony of the royal family; impulsive, impatient . . . and she has always wanted a pet girl of her own. Chevalia needs Pippa’s help, and with Stardust she sets out on a quest to find the golden horseshoes and embarks on the most exciting adventure of all – friendship. My niece has been reading Princess Pony books so when we had a chance to read one my 5 year old was so excited! I didn’t know much at all about these stories but it turns out that this is the first in a series of six books about the magical horse land of Chevalia. Chevalia is peopled by horses, there are no people there. As you would expect from the title they have a horse royal family too. But things are not all well in Chevalia as the eight magical horse shoes that keep the place in existence have vanished, they need to be found by Midsummer’s Day or the island will disappear. Pippa is brought to Chevalia by two impressive sea horses as she could be the one to find the magical horse shoes and save Chevalia. Pippa arrives at Chevalia where she is greeted with a mixture of welcome and suspicion by the horses who have never seen a human before. Pippa makes friends with Princess Stardust and realises she has to help locate the missing hose shoes. The two become friends,( I liked the scene where they both recognise that to the other they are usually a pet) and set out to search for the golden shoes. The book is well written, it has humour, mystery, princesses and, in this first story, a focus on friendship. We enjoyed all these themes and they are all things that appeal to young girls. If you have a horse lover then I am sure she would love them, but even for a non-horse person there is much to revel in. I was slightly apprehensive about whether I would like reading this to my daughter, but it turned out to be better than expected. It is girly, horsey, sparkly stuff, but Chloe Ryder has used interesting words and good prose so that it is not sickly or overly sweet. It held the attention of my daughter, but it was not asked for every night. She got into it more towards the end. I think she is still a bit too young for it really and there were things that she did not understand. She enjoyed the parts about Pippa’s journey to Chevalia and the search for the horseshoes. As she gets older and understands more about horses (and about stories) she’ll appreciate it more. She does want to know what is going to happen next in the story, but I think she would get more out of it if we waited at least another year to read more, and probably even more if we waited until she was able to read them herself. Verdict: Overall, an entertaining read for younger girls. I expect we’ll be collecting more in the series at some point. We are delighted to welcome Amy Joy Lutchen as she shares an extract from her debut novel,Renhala. The first book in her urban fantasy series. As an unexpected warmth flows into the room, running over my feet first, I freeze. It slowly crawls up my body, touching my hands and forcing them to reach forward. As the heat envelopes my head, I suddenly yearn to possess this deadly treasure, so I touch it, and the pole comes off the wall with one pull. I embrace it, suddenly feeling I will never be disconnected from my new lover, because it is me and I am it. I swing, and it is light in my hands. The metal whistles as it slices air, singing its song of perfection—perfect balance. Suddenly, I am torn from my find by a peculiar noise accompanied by the faint smell of rotten eggs. I know the smell, and I run to the door, not wanting to be cornered in this room. That’s when I see it standing in the road, and it’s huge—at least eight feet tall and five feet wide, with dark brown skin and fur. I recognize the feet—all three of them, situated like a tripod, with the center leg slightly forward. Its full hideousness is far worse than its feet alone. The huge eyes that take up at least 50 percent of its head stare at me while its mouth, which seems to take up the other 50, quivers, drooling some dark liquid. I can’t be sure, but it looks like it’s hungry. It stares at me as though I’m a huge medium rare rib-eye steak. There are sprouts of fur here and there around its body, and its arms dangle below its waist. It wears a large loincloth and short pants, both shredded on the edges. There is also a band around its waist, somewhat resembling an extra, extra, extra large fanny pack. I stand, frozen with fear at the realization that I’ve been visited by yet another hideous creature. It was not a dream. The delicious meal I just ate starts creeping up my throat, but I swallow, keeping it at bay. A noise escapes from behind the creature. Its ears quiver, and its head turns all the way around like an owl’s, then swivels back toward me. I’m amazed by its flexibility. Its skin seems to be in constant movement, and it begins moving toward me quickly. It’s so fast. And so big. I grab the pole and stabilize myself, knowing I cannot outrun this abomination, and it’s time to prove I can take care of myself. Seconds before it reaches to grab me with its monkey-length arms, I duck and swing the pole out, but the creature jumps over me swiftly. It lunges again quicker than expected, and I manage to somehow cut my leg with my own weapon. The flow of blood freezes me, vulnerability creeping up on me like a dark shadow. The creature makes the jump toward me. I fall directly down, sticking my pole spade straight up in its direction with my eyes closed. My movement is unexpected—by both of us—so the creature comes down slightly crooked as my blade nicks the inside of its leg. Black ooze runs down its leg, dripping onto the dirt. Black ooze. Before I lose myself to the visions, I notice the tears in its eyes. This big, ugly creature—surely sent by Satan himself—is crying, and reeks of regret? “Ow! You hurt Bu! How could you? Bu was only going to help you.” Its voice is undeniably male and youthful as it wipes the dark ooze from its mouth on the back of his hand, then proceeds to lick some off. “Oh, gross,” I say, totally disgusted. I hold the pole weapon out in front of me. He then does something unexpected—giggles. It’s then that I feel it—purity. Purity of heart and soul is spewing from him, like rays from a sun, warm and soft as cashmere. To learn more about Amy and her work you can visit her Facebook page (here), her Website (here) or her Goodreads Authors page (here). Alternatively follow and converse with her onTwitter (here). Renhala is avaliable to buy now from Amazon.com (here)and Smashwords(here). The Hueys are back! Oliver Jeffers’ egg-shaped creatures may look the same, think the same, and even do the same things, but that doesn’t mean they always agree. The only problem is, they can’t seem to agree on what they disagreed on in the first place! Which ultimately leads to an even bigger disagreement! Confused? Well, so are the Hueys. Which only adds to the fun and hilarity. Although I’ve seen Oliver Jeffers’ books and know they are wonderful, for some unknown reason we don’t have any and my girls haven’t come across them. Being given this to read was an excellent opportunity to remedy this situation. In this story the Huey’s, who usually agree on things, have a disagreement. Oliver’s drawings are great, they are simple, and yet in no way simplistic. The Huey’s are draw in black and white line drawings with splashes of colour. The argument is a cloud of colour and lines above their heads as they grumble and moan. It’s just how to imagine a row. It also made it really relatable for the children. As any parent knows children fall in and out all the time, often over the most trivial of things. They were glued to the story and at the first reading you could see them checking out the pictures and taking it all in. I loved the page where Gilespie has asked what the problem is and the Huey’s all stand in silence as none of them can remember what the problem was in the first place. Dare we say so often typical of all of us not just children? I also loved the way the text was partly narrative and partly speech bubbles, something my older girl who is learning to read also picked up on. The other thing that I found interesting about this was that after hearing it the first time, instead of the ‘again’ we so often hear, my five year old wanted to take the book off and go by herself to look at it. She spent a good while just sitting looking at the pictures. Verdict: So a highly recommended book with an ending that made me laugh out loud. We must invest in more of this author’s work. Pruedence and I have signed up for The New Adult Read-a-thon hosted by the lovely Faye of Daydreamer’s Thoughts (visit her awesome book and film review site here) and Laura of Bookish Treasures (visit her NA shrine here). 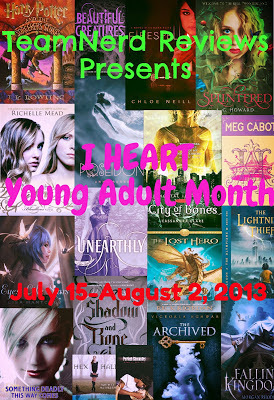 The aim of the week long read-a-thon is to read as many New Adult titles as possible. Pruedence and I will be posting everyday with progress report and mini reviews. We will also be hosting a mini challenge with an awesome (in my opinion)prize which will be open to INTERNATIONAL entrants. For more information about the readathon or to sigh up to the event visit the New Adult readathon announcement page (here) or check out Faye’s Vlog post below! Dare You To is the very anticipated sequel to Katie McGarry’s fantastic debut novel Pushing the Limits (read my review here). Before I start discussing Dare You To I should first explain the sheer impact it’s prequel had on me. Pushing The Limits was unquestionably one of my favorite reads of 2012 and set a very high bar for Dare You To. The emotions and themes touched by Katie McGarry in this prequel were heart wrenching to the point that I will confess that by the end I had shed a tear or two. Suffice to say that I had high expectations for Dare You To given what Pushing The Limits had previously delivered. In all truthfulness although I did enjoy Dare You To it did not touch me the way Echo and Noah’s story did. Picking up with one of the trio of friends to whom we had previously been introduce to in Pushing The Limits, Dare You To is the story of Elisabeth, who prefers to be called Beth (and she is quite vocal about this preference), and Ryan. Like in Pushing The Limits alternate chapters are written from either Beth’s or Ryan’s point of view, a style of narration that I always very much enjoy as it allows an increased insight into each character’s mind, personality and into the different relationships they have. Similarly to Echo and Noah, Beth and Ryan each have a complicated history. One wears it like shield along side the f*** off sign stamped on her forehead, whilst the other hides it behind a façade of perfection in the hope that if it remains hidden long enough it just might go away. Neither method is healthy and nobody would have thought that two people with such different backgrounds and ways of dealing with it could be each other’s cure. Dare You To had a slow start which I initially struggled a little bit with, but after I got past the first few chapters and once the characters took on a more steady shape, Ryan and Beth’s story picked up the pace and from then onward I struggled to put the book down. As in Pushing The Limits, Katie McGarry strived to tackle important social themes that more often than not interfere with our opinions, choices in life and life itself. Through Ryan and Beth Katie dealt with trust, acceptance and the forever complicated relationships between family, friends and more. Despite liking Beth and Ryan I cannot say that I grew to love them and their story as I did Echo and Noah. I also found Katie McGarry’s writing style initially somewhat different from her previous book. I will admit though that I was so blown away by the prequel that I do not doubt that, despite my best efforts to not let it affect my judgment of Dare You To, Pushing The Limits has in fact compromised my thoughts. It is also debatable that because the overall genre of the story and that some of the afore mentioned themes overlap with those in Pushing The Limits, that this also makes it more difficult to not compare the two. Verdict:This said Dare You To was still a very pleasant and interesting read, and I will be looking forward to reading the final book in this series!